Have you ever wondered where our founding fathers ate? Well now you don’t have to. 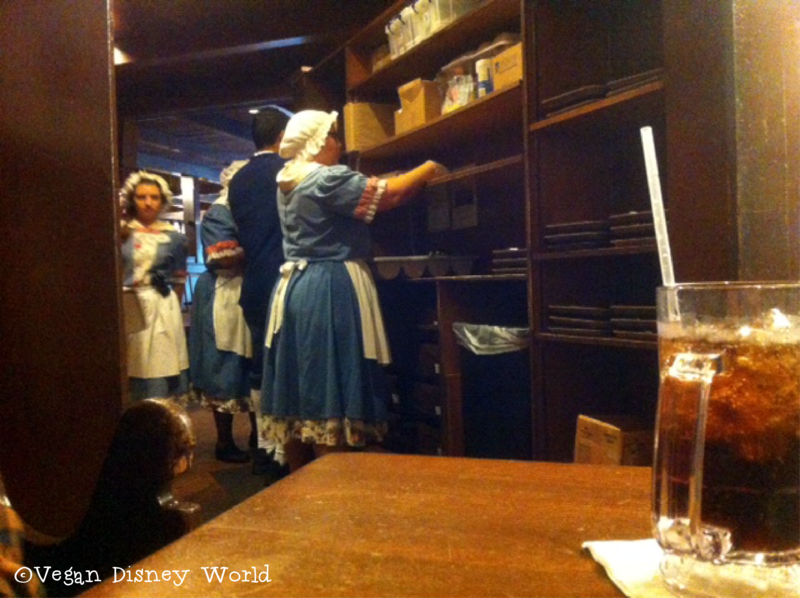 When you step into Liberty Tree Tavern in the Magic Kingdom you immerse yourself into the 18th century and feel like you’re dining in someone’s home. Each room is dedicated to a different founding father which makes the decorations throughout different. 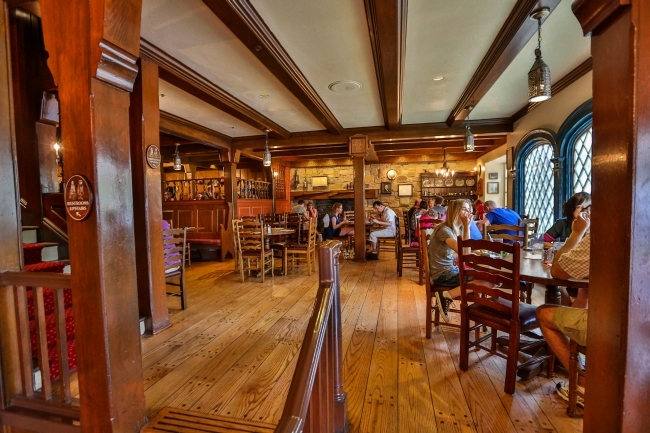 Liberty Tree Tavern is open for both lunch and dinner. However their dinner is Family Style and does not have anything vegetarian friendly on the menu. The lunch menu has an item that is actually listed as vegan. I have been told you can request the vegan item from lunch for dinner but you will have to pay dinner price for it. We went for lunch this last trip (May 2014), this is our experience. First we showed up to our reservation roughly 10 minutes before our time, typically if you show up early to a reservation they will let you in. This was not the case. After we waited 25 minutes after our reservation time, 35 minutes total, we were finally seated. We were seated in a lovely corner next to the kitchen and expo where we couldn’t see any of the decor in our Thomas Jefferson room. Not only did we get a not so great place to sit, but this restaurant is very loud. With all the wood throughout it the sound just carries from everyone’s conversations. 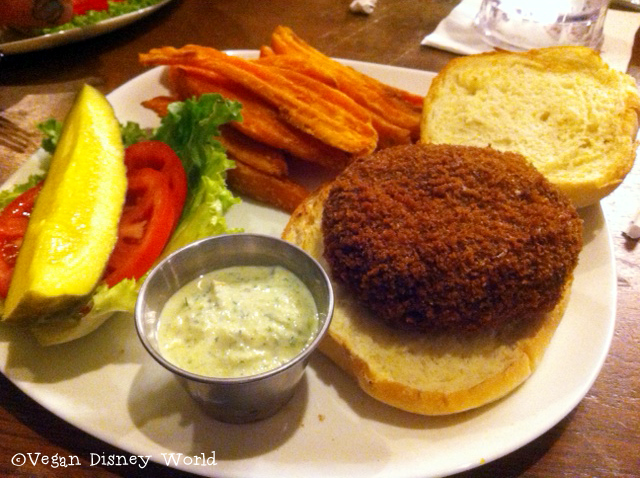 The vegan item on the menu at Liberty Tree Tavern is a Quinoa Burger with Vegan Tzatziki sauce which is vegan as is. This also comes with giant sweet potato fries. The burger itself was very bland and pretty dry. It has peas and potatoes in it and seemed like it was trying to be falafel and not doing a very good job of it. The outside was very crispy which I really enjoyed, until you hit the mush inside, similar to the consistency of mashed potaotes. I was really excited about the vegan tzatziki sauce, however it too was lacking flavor. Mine seemed to be overwhelmed with dill and Corey’s seemed to have none. I tried to load my burger up with the tzatzki sauce to help make the burger less dry but it didn’t seem to help. Some of the fries were undercooked as well but as a whole the fries were the best part of this dish. I wish we had more to say about this place because it was very exciting to see a vegan item actually listed as vegan on a menu. Our dining experience as a whole here was not that great. We got put in a loud corner next to the expo, not very magical, the food was really bland and dry and our wait was entirely too long for mediocre food. No. The only suggestion I have for eating here is if you are traveling with meat eaters they at least have something vegan on the menu.